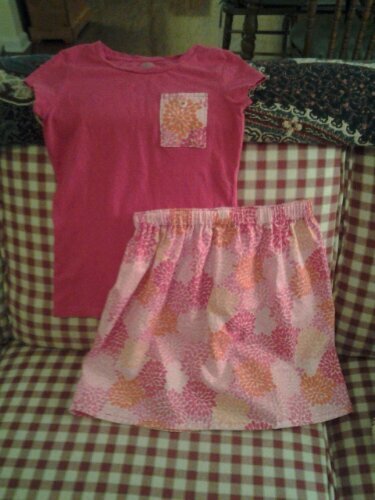 Need a quick, cute summer outfit for a little girl in your life? For about $10 and a little bit of time, you can make something similar. This outfit was made using a purchased t-shirt from Target ($5) and about 3/4 yard of fabric from Joann’s ($3.75). Of course, everything was purchased on sale! I added an embellished, lined patch pocket to the t-shirt. The shirt is simply a rectangle of fabric sewn together with a French seam with a machine sewn hem and elastic waistband in a casing. Tip Use 7/8″ nonroll lightweight elastic if using quilting cotton fabric for the skirt.